This year’s Asia Recruitment Awards in Hong Kong kicked-off in fine style with award nominees and VIPs enjoying pre-event drinks in the cocktail area at the Mira Hotel ballroom. Attendees were then ushered through to the ballroom proper for a night of glitz and glamour as the best and brightest in Hong Kong’s human resources industry were feted for their outstanding efforts in the area of recruitment. A total of 18 judges across a wide cross-section of business areas did a fantastic job of adjudicating 30 recruitment categories. Throughout the evening, attendees were treated to a lavish dinner as well as high-energy music and a light show that kept the vibe up and bubbling, while top wines and beers flowed freely. The evening was capped off with Human Resources publisher Vivien Peters announcing the two grand winners. Morgan Philips was announced the grand winner as Best Recruitment Agency – receiving gold awards for both the Best Executive Search Agency and Best Candidate Experience by a recruitment agency. JTH Group was the grand winner as best Corporate HR Team. JTH clocked up no less than three gold awards for Best On-Boarding Experience, Best Candidate Experience and Best Mobile Recruitment Strategy. Jenny Pong (director of human resources) and Carmen Chan (head of employee engagement) revealed some of the secrets of the success of JTH recruitment in a red-carpet interview with Human Resources magazine post-awards – which will be available for viewing in the coming days. In the meantime, a rundown of all the winners on the big night can be found here. 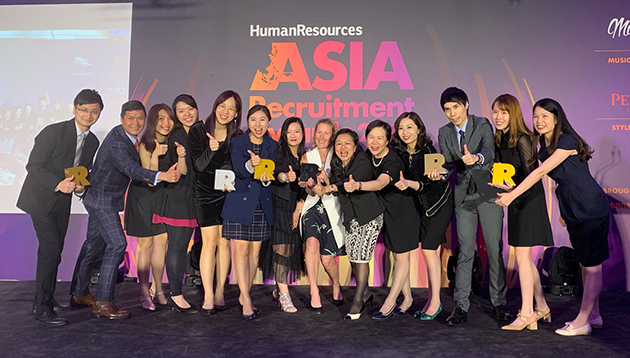 Among the other notable winners were Melco Resorts & Entertainment for Best Mass Recruitment; Cathay Pacific Airways for Best Career Website by a Corporate HR Team; and Amazon Web Services for Best Regional Recruitment Strategy. And a couple of special mentions to the attendees from Niccolo Changsha, who made the trip from Hunan province, China to collect their award in the Best Mass Recruitment category and also Darius Zeederberg (Head of Legal Recruitment) from GRM who flew in all the way from South Africa to receive the company’s gold award for Best Cross-Border Recruitment Strategy. Every office has its resident weirdo, but just be grateful none of these people are in your team (or are they?) ..
LHUB will roll out 5 courses in critical thinking, negotiation, infographics, storytelling with data, and presentation skills by J..